Back in September 2018, I sampled Eat My Shortbread’s Assorted Shortbread Box, and it was delicious. So when they offered me the opportunity to try their butter tarts, a treat I absolutely love, you can bet that I accepted. Here are my thoughts. 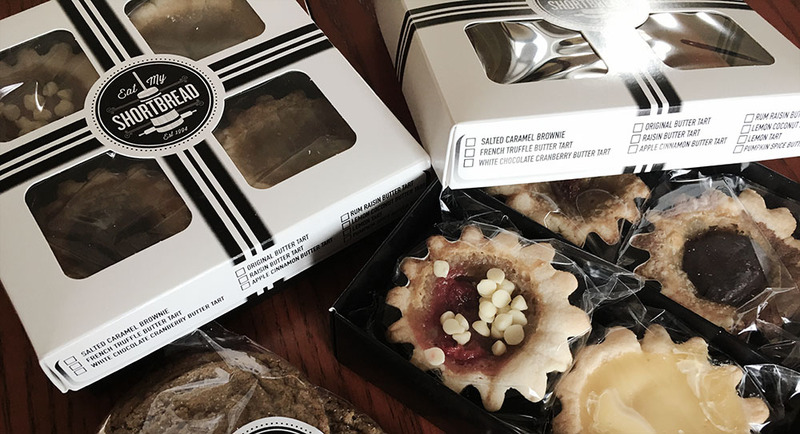 Overall, if you love butter tarts like I do, you should pop into one of their two locations and buy a box. Though I should note that the shortbread crust is a bit different from the classic pie crust you find on the traditional butter tarts. Sugar-butter interior was delicious, exactly what you want from a butter tart. The shortbread crust added an interesting dimension: good, delicious even, but different from the crumbly pie crust you kind of expect when you eat a butter tart. Overall, a delicious treat (perfect size for a treat too…) but not your grandma’s butter tart. This had an interesting flavour combination; butter and cranberry fillings are half and half, split down the middle, so depending on how you eat it, you could get your usual butter tart filling with some white chocolate for added sweetness then cranberry after or vice versa… or both at the same time. Cranberry is a nice tart contrast to the super sweet buttery inside. Shortbread crust is yummy and balances everything out. Nicely buttery; the shortbread crust keeps the butter and raisin from being too sweet; probably my favourite version, if only there were no raisins, because raisins are gross. Filling melted in the mouth. Rather large, as the mousse is mounded in the middle to be higher than the crust. Shortbread is good; chocolate frosting with butter tart later. Not overly sweet. The crust was soft and chewy, as opposed to the crumbly crunchy shortbread. A perfect coffee snack.